"I was born at the beginning of it all, on the Red side—the Communist side—of the Iron Curtain." Through annotated illustrations, journals, maps, and dreamscapes, Peter Sís shows what life was like for a child who loved to draw, proudly wore the red scarf of a Young Pioneer, stood guard at the giant statue of Stalin, and believed whatever he was told to believe. But adolescence brought questions. Cracks began to appear in the Iron Curtain, and news from the West slowly filtered into the country. Sís learned about beat poetry, rock 'n' roll, blue jeans, and Coca-Cola. He let his hair grow long, secretly read banned books, and joined a rock band. Then came the Prague Spring of 1968, and for a teenager who wanted to see the world and meet the Beatles, this was a magical time. It was short-lived, however, brought to a sudden and brutal end by the Soviet-led invasion. But this brief flowering had provided a glimpse of new possibilities—creativity could be discouraged but not easily killed. 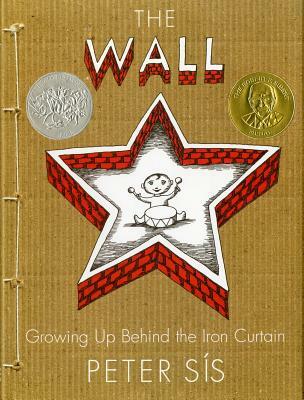 The Wall is a 2007 New York Times Book Review Best Illustrated Book of the Year, a 2008 Caldecott Honor Book, a 2008 Bank Street - Best Children's Book of the Year, the winner of the 2008 Boston Globe - Horn Book Award for Nonfiction, and a nominee for the 2008 Eisner Award for Best Publication for Kids. Peter Sís is an internationally acclaimed illustrator, author, and filmmaker. He was born in Brno, Czechoslovakia, and attended the Academy of Applied Arts in Prague and the Royal College of Art in London. Peter is a seven-time winner of The New York Times Book Review Best Illustrated Book of the Year, a two-time Boston Globe-Horn Book Award Honoree, and has won the Society of Illustrators Gold Medal twice. Peter's books, Starry Messenger: Galileo Galilei, Tibet through the Red Box, and The Wall: Growing Up Behind the Iron Curtain were all named Caldecott Honor books by the American Library Association. The Wall was also awarded the Robert F. Sibert Medal. In addition, Peter Sís is the first children’s book illustrator to win the prestigious MacArthur Fellowship. He was chosen to deliver the 2012 May Hill Arbuthnot Honor Lecture for the Association for Library Service to Children. Peter won the 2012 Hans Christian Andersen Award. This award is considered the most prestigious in international children's literature, given biennially by the International Board on Books for Young People.